How important is it to stand out? There’s a line in a poem by Czeslaw Milosz that’s always stuck with me: “Love means to learn to look at yourself/ The way one looks at distant things/ For you are only one thing among many.” The key to happiness, the poem suggests, is to understand that you’re not that special—so that you can better relate to the world around you. I love that idea, since I’ve never felt particularly exceptional. After all, I grew up with the name Sarah. 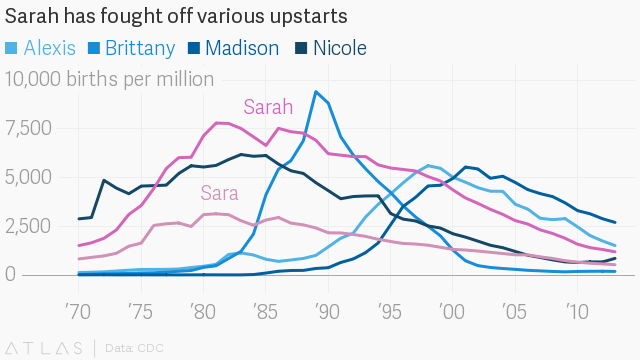 Between 1980 and 2000, the name “Sarah” consistently ranked as the fourth- or fifth-most-popular name in the US. I was born in 1983. The practical effect of this was that I spent my childhood expecting to be one of many anytime I walked into a room. My own father hollered “Sarah Todd” whenever a friend called on the landline, just to distinguish me from all the other Sarah’s who might be hanging out upstairs in my bedroom. Recently, I got curious about whether other people with very popular names felt similarly unattached to their own monikers. There’s been plenty of publicity about the possible drawbacks—and benefits—of unique names. But what are the psychological effects of growing up with a name that you have to share with everyone else? The fact that I’m even bothering to ask this question is a sign of the times, according to Laura Wattenberg, founder of the baby-naming site Baby Name Wizard. And so giving your child a classic, common name can be a way to steer clear of cultural stereotypes and unjust discrimination. Historically, Wattenberg says, research has shown that people find familiar, easy-to-pronounce names to be likable and trustworthy. When you hear from a person with a name like Dave or Jen or Mike, “you’re more likely to answer their email, more likely to swipe right on Tinder,” she says. But a lot of people rightfully take pride in having a distinctive name that speaks to their family’s culture and origins. And bearing a name that practically screams “basic” can present its own challenges. To find out what those obstacles might be, I first turned to my natural cohort: a sampling of Sarah’s. Some Sarah’s said they actually appreciated sharing their name with other people. Sarah Kessler, a reporter at Quartz, told me that she always felt an instinctive affinity with the Sarah’s she met—they had something in common, right off the bat. “It was like we were part of a club,” she adds. Many immigrants follow this logic when naming their children. A 2016 study published in the American Sociology Review, for example, looked at census data on Irish, Italian, German, and Polish immigrants in the late 19th and early 20th century. The authors found a strong correlation between second-generation immigrants with traditionally American first names and occupational achievement. They suggest that parents who chose an American name were signaling their families’ orientation toward cultural assimilation, which worked to their children’s advantage in a society often wary of outsiders. Given the extent to which names are often linked with cultural acceptance, some countries have even gone so far as to restrict parents’ choices to government-approved names. In Denmark, parents must select their baby’s name from a list of 7,000 government-approved possibilities—an attempt to protect children from schoolyard bullying and quizzical stares. This approach seems in keeping with the country’s so-called “Jante law”—the idea of aspiring to be average, which in turn leads to happiness, as people are satisfied when ordinary things happen to them. Icelandic parents must pick from an even smaller curated list: 1,800 girls’ names and 1,700 boys’ names. Sweden and Norway regulate baby names as well, and France had a list—heavy on the names of Catholic saints—until 1993. Of course, some names on government-run lists are bound to be more popular than others. But they’re all indicative of the countries themselves: often-homogenous cultures that prioritize assimilation and a sense of belonging. In the US and the UK, by contrast, the overall trend is toward more unique names—indicative of these culture’s more individualistic mindsets. “Finding a name that has authentic roots, but is completely undiscovered, is the ultimate baby name status symbol,” Pamela Redmond Satran, founder of the baby-naming site Nameberry, told the New York Times in 2013. “Katie’s were always nice and soft, something homemade or home-baked,” she says. “Someone you met through your mom. Definitely creative. Katy’s were popular, athletic, intimidating. Kate’s are really cool. They skateboard. They don’t talk much. They’re mysterious.” Ultimately, Kati decided to go with Katie, then dropped the “e” from her nickname in the sixth grade. “I felt pretty unique after that,” she says. There’s also the option of attempting to change your name to something a bit more unusual. When I went to boarding school at age 16, I thought about going by one of my middle names, Charlotte. But I ultimately stuck with Sarah. To be a Charlotte, I felt, meant committing to a particular kind of personality—someone polished and feminine, the kind of girl who went to art galleries on weekends and spoke flawless French. The issue wasn’t so much that I didn’t feel like a Charlotte as that I was afraid of not living up to it. Sarah, by contrast, was reassuringly commitment-free. A recent study (pdf), published in the Journal of Personality and Social Psychology, confirms my suspicions about the anonymity conferred by a common name. Over the course of eight experiments, researchers asked people in France and Israel to look at photographs of strangers’ faces and guess their names from a list of five possible choices. Participants selected the correct name far more frequently than pure chance would allow. Why are people able to guess the right names with such frequency? The researchers suggest it’s because our appearances are shaped by the cultural expectations and stereotypes associated with a given name. “We show that people change their faces as they grow,” explains Anne-Laure Sellier, who co-authored the study and is a visiting assistant professor of marketing at New York University’s Stern School of Business. “You’re conditioned to look a certain way, because you want to fit in and be accepted.” We expect a girl named “Joy” to be cheerful and smiley, for example, so she develops a bright personality accordingly. But there are exceptions. “If you think of a stereotype, a stereotype for Sarah is noisy,” says Sellier. There are too many examples—Sarah Michelle Gellar, Sarah Palin, Sarah Silverman, Sarah, Plain and Tall—to conjure up a firm association. As to whether it’s a good or bad thing to grow up with a name that’s basically a blank slate, Sellier is uncommitted. “Maybe there are too many degrees of freedom and you don’t like it,” she says. “Too much choice is not good.” On the other hand, when you’re not saddled with cultural expectations about what a person with your name ought to look or act like, you can make of yourself what you will. And that’s the gift my parents passed onto me when they chose my name. I may not have a name that feels particularly descriptive, but it has made me feel free. As a kid I knew Sarah’s who were bookworms and Sarah’s who were bold and popular, Sarah’s who could do tricks on the jungle gym and Sarah’s who were class clowns. I read about people with my name who were inventors and musicians and activists and writers. And so I grew up understanding that I might not have to choose. In this way, perhaps parents who give their children a common name are making their own kind of wish. Keep your options open, they’re saying. You could be anyone.